Welcome to the website of The Shapinsay Development Trust, a registered Scottish Charity Number SC034818. 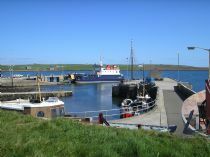 The Trust was formed by the residents of Shapinsay. Its role in the greater scheme of things is to be the vehicle through which the islanders can collectively help to maintain and improve their lives on the beautiful, peaceful island of Shapinsay. All Shapinsay residents over the age of 18 can apply for membership of the Trust. The Directors of the Trust are elected from within the membership of the Trust by the members. For further details of the formation of the Trust and its operation please take a look at How SDT Works. So if you want to come and help us ensure that our way of life here can continue then please take a look at how to Get Involved. Please remember that this is the best way you can help your island and your community.